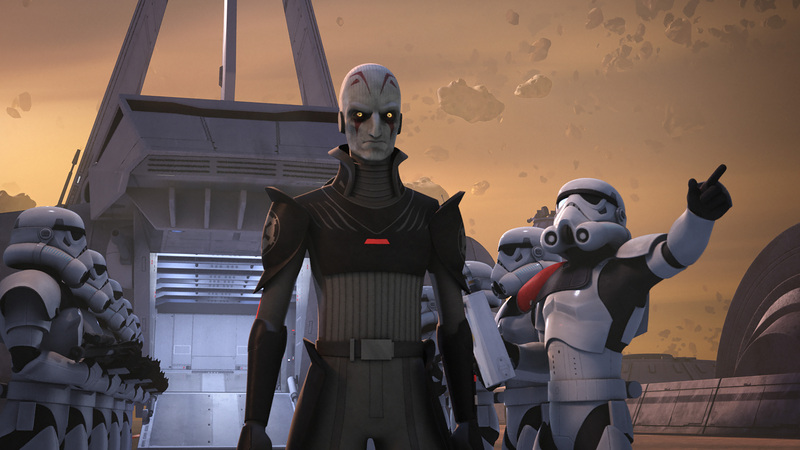 At the Star Wars Celebration Rebels panel they debuted the trailer for Season 2 of Rebels. Again, more great work from Dave Filoni and company. For Clone Wars fans the trailer features the return of Captain Rex and that villainous pirate Hondo Ohnaka. Looks to be a great season! Fair warning: This episode just aired on DisneyXD tonight and is also available through the DisneyXD app so there are spoilers ahead!!! Last week’s episode, Empire Day, was perhaps the best episode of Rebels to date, and left viewers with an exciting cliffhanger. Agent Kallus and the Inquistor were in hot pursuit of our heroes, and in danger of capturing them once and for all. 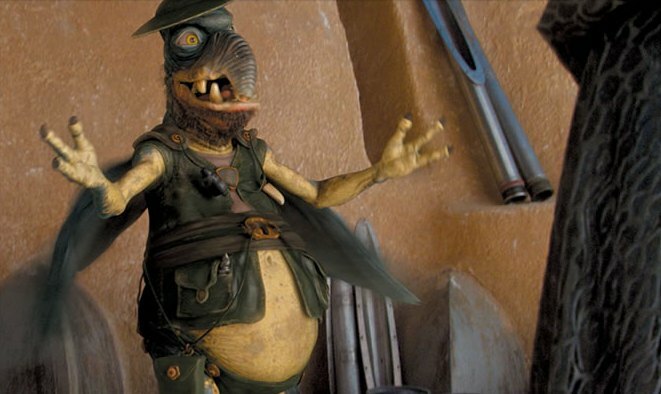 Meanwhile, the renegade Rodian Imperial worker, Tseebo, was about to reveal to Ezra the fate of His mother and father. Unfortunately, Gathering Forces is an episode which looses focus on the central plot established in Empire Day, and instead focuses on Kanan’s command decision to confront the Inquisitor along with Ezra. While that subplot works brilliantly on its own, as a conclusion to this two-pary arc, it feels rather clunky and forced. Our story begins right in the middle of the action where we were left at the conclusion of Empire day. Our heroes, aboard the Ghost are trying to desperately outrun a group of T.I.E. fighters led by the evil Inquisitor. The ship is being pummeled by blaster fire and shields have nearly collapsed as Kevin Kiner’s score ratchets up the intensity. During the battle the Inquisitor manages to launch a tracking device which attaches itself to the hull of the Phantom, a small craft docked on the Ghost. Chopper has been knocked out of the fight and it is up to Ezra to affect repairs so the ship can jump to lightspeed, however Ezra’s skills are a bit limited, but the timely arrival of Tseebo to the cockpit saves the day, and the ship blasts to hyperspace. However, the crew’s sense of relief is short lived when Tseebo reveals that the Imperials have placed a tracker on the ship. Hera and Kanan debate the next course of action with Hera recommending the crew stay together to ensure Tseebo is safely delivered to their Rebel contact, the mysterious Fulcrum. However, Kanan believes the best course of action is for he and Ezra to take the Phantom and drop out of lightspeed at the abandoned asteroid base featured in the episode Out of Darkness. Hera is not convinced (and neither was I… more on that later), but ultimately relents, so Kanan and Ezra prepare to take off as a diversionary tactic. Meanwhile Ezra is growing increasing frustrated with Tseebo’s presence on the ship. He soon reveals that Tseebo was in fact responsible for Ezra’s parents disappearing, and had failed in his task to take care of Ezra for his parents. Ezra clearly resents the impact that Tseebo has had on his life, but quietly admits that if he had not been orphaned he would never have learned how to survive. Tseebo’s story is made even more tragic as he reveals that all he wants is forgiveness from Ezra, but that appears to be something that is not coming soon. In an exciting sequence, the Phantom is detached from the Ghost while still in hyperspace. Eventually Kanan manages to gain control of the little craft and sets down at the old abandoned Clone Wars era asteroid base. Kanan informs his young Padawan that he will have to use his training and reach out and control the minds of the vicious shadow beasts before the Imperials arrive. However, Ezra is filled with fear, and at first cannot control the creatures, but in this moment Kanan uses his fear of the beasts to conquer his real fear… that he will learn the truth about his parents. He is finally able to summon up his courage and overcome that fear, and in a very powerful scene reaches out to Tseebo through the Force and tells his old family friend that he is forgiven. Having overcome this fear Ezra is now able to control the shadow beasts. Just then, the Inquisitor and his troops arrive only to find Ezra and Kanan defended by a large den of dark critters… all hell breaks loose. Kanan and the Inquisitor face of in a quick, but intense duel with the Inquisitor quickly getting the upper hand, and almost toying with Kanan along the way. 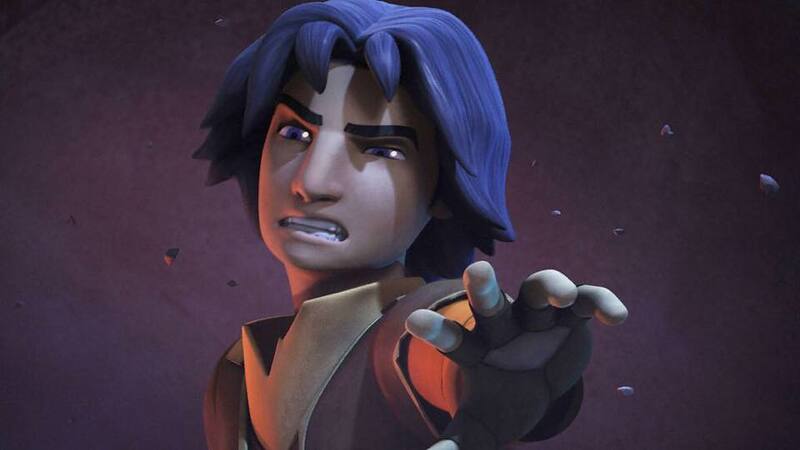 With a powerful Force push he hurtles the Jedi away, and turns his attention to Ezra. Alone now, and once again faced with fear, and now anger as he sees his Master unconscious at his feet, Ezra channels his power to a much darker place. The Inquisitor even eggs the young apprentice on, and goads him into tapping into the Dark Side. Ezra does just that, summoning what appears to be the queen of the shadow beasts, and enormous creature which dwarfs the other creatures. Ezra commands the beast to attack the Inquisitor. Meanwhile, Ezra gathers up his Master and they run to the Phantom making their escape, and disabling the Inquisitor’s shuttle in the process. Meanwhile, back on the Ghost, the crew delivers Tseebo to Fulcrum (whom we never meet), and we are once again left to wonder the fate of Ezra’s parents as we cut away right at the moment Tseebo is about to tell Hera what happened. It’s a frustrating tease which really feels drawn out now for no good reason. Finally, Kanan and Ezra are reunited with the crew, but Ezra has a lot on his mind and doesn’t appear to be quite ready to hear about his parents just yet. 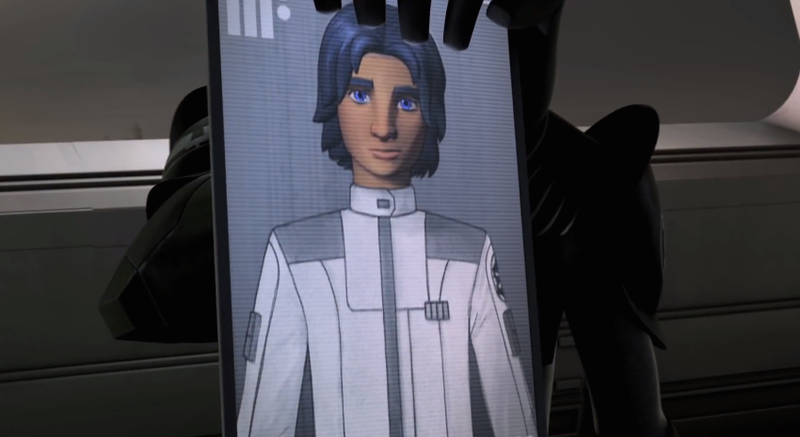 In the poignant final scene of the episode, Sabine presents Ezra with a gift for his birthday (member last episode we learned Ezra’s birthday was on Empire Day); a cleaned up holographic picture of Ezra with his parents before the Empire arrived at Lothal. Those were clearly happier times, and it’s a fitting conclusion to the arc. 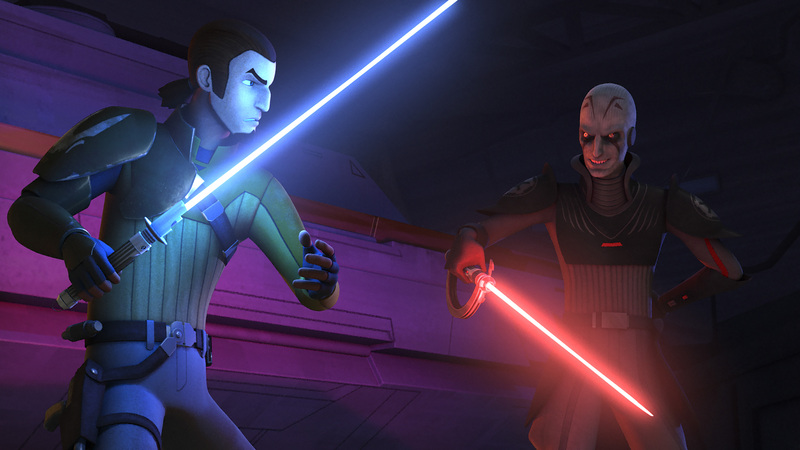 Gathering Forces concludes with a great light saber duel between Kanan and the Inquisitor. The choreography of the fight is very dynamic with the Inquisitor uses a technique very akin to traditional fencing versus Kanan’s slightly less elegant style. This works perfectly with the Inquisitor’s arrogant attitude and leaves the viewer with the impression that the Inquisitor is simply toying with Kanan and has the upper hand. Ultimately the Inquisitor dispatches Kanan with minimal fuss, leaving Ezra alone to handle the dangerous Dark Side Force user. In a very powerful moment, Ezra reaches out with the Force in his anger and rage and summons the queen of the shadow beasts and directs it to attack the Inquisitor. There’s some great animation as the air literally seems to stand still as wave of the Force call out to the creature, and Kanan’s face is filled with dread as he knows exactly what power his young Padawan has tapped into. This episode is also chock full of terrific performances; Gathering Forces may very well be the best acted episode of the series to date. 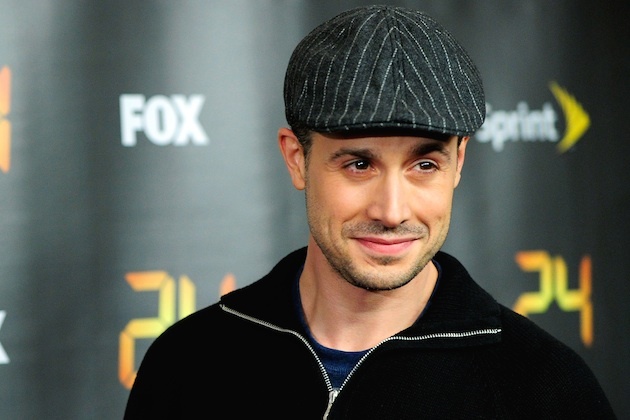 In particular, Taylor Gray, Freddie Prinze, Jr., and Jason Issacs turn in some tremendous work building up the drama and tension of the episode’s terrific finale. Issacs turns in his usual deliciously villainous work with the Inquisitor, spewing out his venomous lines with a nasty haughtiness which really makes you love and hate him simultaneously. But Freddie Prinze, Jr. in particular really seems to have found his voice in Kanan and brings a tremendous amount of depth to the role in Gathering Forces. His love of Samurai and martial arts films really comes through in his work as Ezra’s Master. Yet there is also edginess to the role which suggests that in many ways he’s flying by the seat of his pants, and is probably in a little over his head. Kanan is slowly emerging as my favorite character of the show, and a great deal of that is in part to Freddie Prinze, Jr.’s acting chops. However, this really makes no sense, as we’ve seen no evidence in the show at all that the Inquisitor can track our heroes’ location through the Force. He may get odd premonitions, but nothing that would lead him to discovering the Ghost crew had pulled one over on him until they were far away. Also, as we’ve seen through numerous episodes, the crew works better when they are a team, and all work as one. Whenever characters get separated from the rest of their comrades, that’s when the trouble starts, and you can see that as a theme in practically every episode. A united family makes a stronger force for good than a fractured one. Ditching the Phantom makes the most logical sense, and allows our intrepid band to complete their mission in the shortest amount of time possible. Remember, Tseebo and the Imperial secrets he holds in his cybernetics are vitally important. But Kanan’s decision to make his “last stand” at the abandoned asteroid base only makes matters worse and is a very questionable decision too. Regardless of the crew’s experiences in Out of Darkness, the Empire is unaware of this location and it could still be of use as a secret location for drop offs with Fulcrum. The crew would simply need to be cautious, and now that they are aware of the danger it would still be a suitable location to conduct drop offs. But now that option is completely off the table as the Imperials know of the location. Kanan’s decision to leave the Ghost and take the Phantom simply comes across as a little reckless and a decision based more on emotion and a desire to confront the Inquisitor and stop him. That doesn’t seem very Jedi-like. Rather than focus on the mission of delivering Tseebo and the Imperial secrets he stole to their Rebel contacts, Kanan is almost going out of his way to place himself and his Padawan in harm’s way. And to make matters even worse he really places Ezra is a very dangerous spot by making him try to control the shadow critters who inhabit the mountain at the asteroid base. So, far we’ve only seen Ezra fail at trying to control one lone, wild Lothal cat; this is not the time to test his young apprentice, especially as the Imperials are fast approaching. I simply found the plan to be foolhardy and reckless given the stakes if the crew failed to deliver Tseebo safely. Ultimately, what really bothered me about Gathering Forces is that the episode did not feel like the conclusion of the story which started in Empire Day. Once Ezra and Kanan leave the Ghost this almost come across as a one off episode, and the payoff to the story that was being laid in Empire Day comes across as an afterthought. We gets hints and suggestions to who Fulcrum is, we are teased, once again, regarding the fate of Ezra’s parents, but ultimately there’s no conclusion as we divert attention from the main plot of delivering vital stolen Imperial data to the Rebels to a lightsaber duel on a remote asteroid. It makes for a poorly thought out conclusion to the story, as if the writers really didn’t know how to wrap up the story, or had simply run out of time to tell a self contained episode and padded the story to stretch it out to two episodes. Unfortunately Kanan’s plan leads to another beef I’m beginning to have with the show… the reuse of character and location models. The decision to return to the abandoned asteroid base almost comes across as a cheat, and a means to finish the arc on the cheap by reusing a location they’ve already visited. Now to be fair, in the early days of an computer animated series your are going to reuse characters and locations until you can build up enough assets to populate worlds with a variety of animals, plants, and locations. But Kanan’s plan already felt needlessly forced, and this just highlighted the frequent criticism among some fans that the show appears to be made with a modest budget compared to The Clone Wars. This is not necessarily a fair comparison, but Clone Wars raised the bar so high that it makes the show’s visual shortcomings stand out like a sore thumb. Having said all that, Gathering Forces has some of the most stunning visuals of the series to date. In particular the lightsaber duel on the asteroid base is a visual treat as is the opening space battle. There are some terrific, visually dynamic moments in the episode that are almost on par with the films, and it is clear Dave Filoni and crew understand the visual language of Star Wars, there are just some areas they need to tighten up to reach the visual quality of storytelling they aspire to. Overview: Gathering Forces is one of the most frustrating episodes of the show to date. There are some really great character moments in this episode and the final confrontation between the Inquisitor, and our Jedi duo, Kanan and Ezra, is superbly crafted. However, Kanan’s plan to save Tseebo makes no logical sense and comes across as just an excuse to set up a story which will end in a lightsaber duel. The result makes Gathering Forces feel less like a continuation of Empire Day, and more like a self contained episode which just happened to reference it. Loose plot threads are left everywhere, and we are never really given a proper payoff for Tseebo in the episode’s conclusion. Unfortunately, his story and the fate of Ezra’s parents will have to wait for another episode. NOTE: If Gathering Forces was a standalone episode only focusing on Kanan and Ezra’s confrontation with the Inquisitor this would have rated much higher, as those elements alone work quite well. However, I’m grading this as part two of an arc, and compared to Empire Day this episode is simply a weak conclusion. Fair warning: This episode is airing tonight on DisneyXD so there are SPOILERS ahead!!! Every television show has its stumbles, and not every episode can be a hit. To use a baseball analogy, while Rise of the Old Masters and Breaking Ranks were game winning, walk off, extra base hits; Out of Darkness felt more like a slow roller to the short stop with the runner on 1st being put out on the force at 2nd, and the batter barely beating the double play throw to 1st. It’s an okay result; you’re safe, but you are left feeling a little empty. 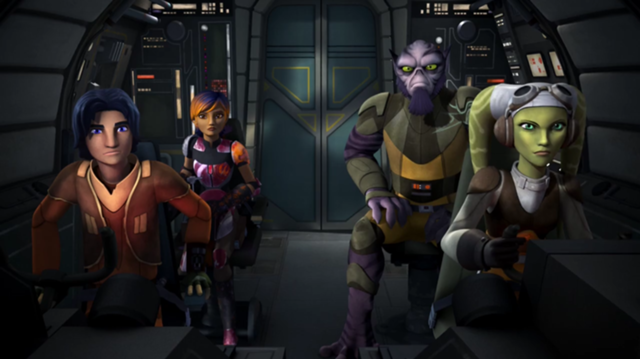 The episode begins with Hera, Ezra, and Sabine returning from a mission with Imperial T.I.E. fighters in hot pursuit of their small craft, The Phantom. Hera deftly evades the incoming craft while exchanging some painfully awkward dialog with her two young passengers. Eventually through some hot shot piloting Hera finishes off the last of the T.I.E.s, but not before seriously scraping the underbelly of The Phantom, resulting in a serious fuel leak. Returning to the Ghost, Hera asks Zeb, Ezra, and Chopper to run a full diagnostic of The Phantom before she takes off again for a rendezvous with their mysterious contact, Fulcrum. While the gang heads off to run their system checks, Sabine confronts Hera and suggests she is being less than forthcoming with information about the mission they were just on and who exactly is Fulcrum. Hera explains to Sabine that sometimes there is information that she needs to know as one of the leaders that simply cannot be shared with young Mandalorian. This does not sit well with Sabine who is clearly frustrated. Meanwhile, Zeb, Ezra, and Chopper continue their comedic antics from previous episodes complete with jovial shoving, zapping and punching, all the while trying to complete The Phantom’s diagnostics. All of their shenanigans lead leads them to miss the massive fuel leak from the ship’s fuel line (of course). This moment completely took me out of the episode recalling numerous episodes of Star Trek where distracted crew members just happen to miss a critical failing ship’s component which launches the main plot of the episode. I had to ask myself after two viewings if this crew had been functioning as resistance fighters for some time how could they be so cavalier about the functionality of a key component of their job? Hera contacts Fulcrum who informs her there is an important cargo for her to pick up on an abandoned asteroid base near their location. Sabine demands to be included on the mission, and after a bit of cajoling, Hera relents. So the two hop aboard The Phantom and make the hyperspace jump to pick up their mysterious cargo. The two arrive at an old, abandoned military installation, but find no sign of their Rebel contact. However, they do locate the cargo containers they were supposed to pick up. Sabine asks what’s in the containers, but Hera is reluctant to divulge what she knows. She explains to her young companion that sometimes in this fight it is better that some are left in the dark so the Empire cannot learn of the Rebel’s plans in case one of them is captured. Sabine simply isn’t buying it and says she cannot truly feel like part of a team if things are being hidden from her. They begin loading the cargo when Hera notices something is wrong. One of the crates that had been sitting on the landing platform is now missing, and she suspects it has been dragged away by a creature into the shadows of the abandoned cliff face base. Inside they are completely surrounded by darkness, and are left with the uneasy feeling that they are being watched. They find the missing crate and soon the thief is revealed. Hera and Sabine find themselves surrounded in a nest of gruesome black creatures which walk on their hind legs. The two women battle the animals off, and eventually retreat to the landing platform. However, the animals retreat in fear and pain when they are exposed to the light. Hera and Sabine are safe for now. They make their way back to The Phantom only to discover the ship is out of fuel. Hera calls The Ghost for a pickup, but it will take time. Unfortunately the duo have little time as the sky is littered with asteroids which periodically block out the sun, allowing the foul creatures to rush our heroes under cover of darkness. 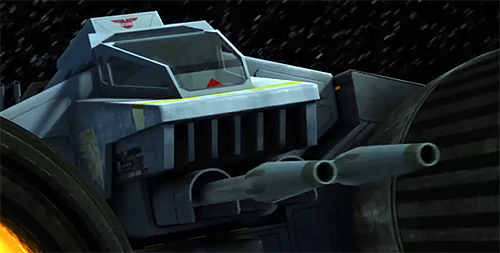 Sabine devises a plan to make a last stand while they wait for their rescue. She finds canisters of rhydonium, a highly combustible material, she can use as explosives to force back the waves of incoming predators. Eventually a very large asteroid blocks out the sun and the creatures make their attack. Wave after wave of the creatures advance, and while Sabine’s plan is working, both she and Hera are running out of real estate as they are pushed back by the onslaught of these monsters. Hera and Sabine make their epic last stand atop The Phantom, when suddenly The Ghost arrives to save the day. The Phantom is loaded aboard The Ghost and the crew narrowly escapes with their lives. 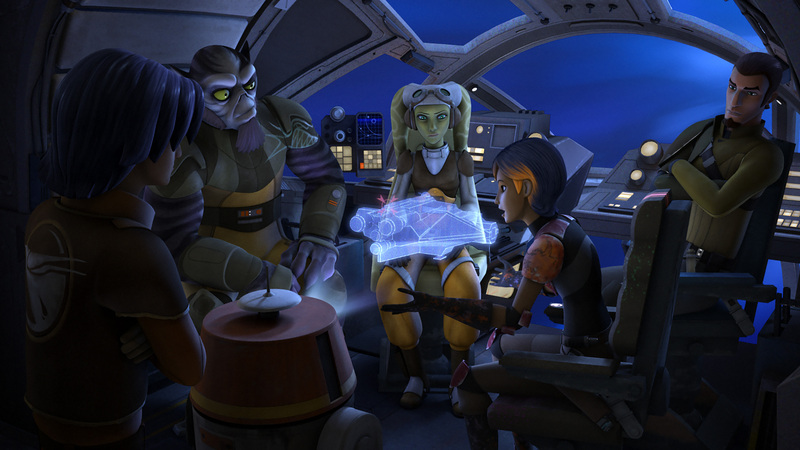 The episode concludes with Hera explaining to her young friend that she will try to be more open with information, but that Sabine needs to understand that she is a valued member of the crew, and Hera trusts Sabine with her life. While this makes for a nice little coda to the episode we are unfortunately left with more questions than any sense of resolution. Kevin Kiner once again turns in a superb score. There are great moments filled with flourishes and staccato rhythms which drive the action the episode, but where the soundtrack really stands out is when Hera and Sabine arrive at the abandoned outpost. There is a beautiful, unsettling quality in the score which raises the creep factor and accentuates the mystery of what danger is lurking in the darkness of the asteroid base. There are some great visuals in Out of Darkness, specifically the design of the abandoned outpost and the lighting. Visual Effects designer, Joel Aron, creates a lot of production value out of the limited resources used in this episode. The lighting at the landing platform on the asteroid base accentuates the growing danger in the episode, and gives the visuals an almost realistic feel. The only downside is this episode, like other Rebels episode, uses very few visual elements. Like Season 1 of The Clone Wars, the series has a limited catalog of character, vehicle, and locale models; subsequently the show looks like it was made on a fairly limited budget. However, as the show goes on I’m sure the visual pallet will expand offering us more variety on a bigger scale. Kevin Hopps is a very familiar name with those who follow the animation industry. He has been working in the business for years, and has scripted a number of outstanding shows. He also wrote the screenplay for the Rebels episode Fighter Flight, and unfortunately, like that earlier episode, the script is the weak link. Out of Darkness’ is filled with moments of forced humor and poorly executed drama that feels stiff. Initially I thought the problems may simply have been the execution by the actors, but multiple viewings made it clear this was simply a bad script, that felt like standard Saturday morning cartoon fare. The episode is supposed draw the viewer in as more layers of the episode story are revealed. For example, who is this Fulcrum character, and what’s inside the crates? Why is Hera so quick to identify a specific crate she alone is meant to handle? Unfortunately the crates wind up being nothing more than a poorly executed McGuffin, and we are left in the dark as much as poor Sabine. There are no answers at all, which of course creates another problem for the story; since there is no payoff, and we only know the crates are important, there are no real stakes in the episode. If we even had a vague clue what the contents of the crate were we might feel invested in the characters and the danger growing around them, but as it is the audience feels little motivation and is left to wonder why Hera and Sabine don’t simply abandon the mission and call the Ghost to rescue them at the first sign of trouble? At this point in the series I’m getting very frustrated with Sabine, or to be more specific, with how the screenwriters handle her. So far Sabine is far and away the hollowest character on the show. She’s your typical smart, but sassy teen girl who is prone to whining and is found on dozens of Disney-like shows. There’s really nothing about her character that makes her truly standout other than her Mandalorian duds and her explosives. While I feel like I have a good idea about what motivates Ezra, Kanan, and Zeb, I really have no idea what made Sabine the frustrated artist/anti-establishment Rebel that she is today. This episode tries to offer a clue about Sabine’s background when she suggests she left the Imperial Academy on Mandalore because she felt like the Empire was keeping secrets from her. But this little nugget is left on the table with absolutely no resolution. Are we really supposed to believe she left the Empire because they wouldn’t provide her with information that, as we used to say in the Army, was “above her pay grade?” Wouldn’t it be more compelling if Sabine and her fellow cadets were witnesses to something terrible, or were forced to participate in some atrocity? Maybe this will be revealed at a later date, but as it stands it’s simply vague and muddled. Yes, this is a kid’s show, but her motives need to run a little deeper than I’m ticked off at the Empire because they are keeping things from me. Ultimately it makes her come across as less of a freedom fighter and more of an entitled feeling teenager. Unfortunately, Hera appears to be suffering the same fate as Sabine. When the show was announced, I was immediately drawn to Hera, especially given the potential Clone Wars ties her surname suggested (Syndulla was the family name of a freedom fighter who appeared in a Clone Wars arc). However, after six episodes we still have yet to really examine her as a character and be given a motive that drives her. Hating the Empire is all well and good, but why, why has she picked these people to assemble as the crew, and what are her ties to Lothal. I understand that many of these answers are found in the pages of John Jacson Miller’s outstanding spin off novel New Dawn (review coming soon), but your average viewer shouldn’t have to read every novel or comic to get the “full story” of our heroes. In many ways Hera comes across as the Deanna Troi (Ship’s Counselor on Star Trek) of the show; a character with little actual development who periodically chimes in about what she is feeling or sensing. Hera is supposed to be the “soul” of the crew but she lacks any real depth, and is more of an ideal for the crew to aspire to than an actual character. Overview: Out of Darkness has the vibe of one of those throw away episodes of Star Trek: The Next Generation which focused on the minor characters of the Enterprise crew. It simply feels hollow and unimportant in the grand scheme of things. What should have been a great character driven episode featuring the female crew of the Ghost, is lost in a weak script filled with ham-fisted dialog and ideas which are never fully fleshed out. There are some great visuals in the episode, and initially there is a great creep factor in the episode, accentuated by Kevin Kiner’s fantastic score, but overall the episode feels empty and bereft of any real danger. What makes this episode particularly disappointing is there was a real opportunity to examine the emotions, motivations, and backgrounds of Hera and Sabine, two characters who have largely played second fiddle to the “boys” on the show, but ultimately we learn very little about what makes these characters tick. They simply come across as unformed and underdeveloped tropes meant to draw in female viewers, while being palatable to young boys. Sabine is the tough “warrior chick” commonly found in sci-fi and fantasy programming, and Hera is the “ship’s mom.” That may seem like a fairly harsh assessment, but through a 1 hour movie, and 5 full episodes Rebels has spent little time developing either character, and Hera and Sabine deserve better than that. After posting some pretty dismal ratings last week with Fighter Flight, this week’s episode, Rise of the Old Masters bounced back strong, thanks in large part to ABC’s re-broadcast of the series premiere, Spark of Rebellion, this past Sunday. Last week’s episode had only managed to attract some 580,000 viewers, surprising many Star Wars fans, and calling into question the long term prospects of the show. However, this week’s installment on DisneyXD jumped an impressive 366,000 viewers, with a total of some 946,000 total viewers, nearly matching the DisneyXD premiere of Rebels. It appears the airing of the series premiere on ABC had a significant effect in adding more viewers this week, despite Rebels being pitted against an NFL game that had run into prime time, the opening of Sunday Night Football, and the Pre-Game Show of the World Series. According to Disney, Rebels posted its best numbers ever among kids 6-11. At 9 o’clock, “Star Wars Rebels” generated series highs in Kids 6-11 (359,000/1.5 rating) and Tweens 9-14 (322,000/1.3 rating) and near series highs in Total Viewers (946,000), Kids 2-11 (452,000/1.2 rating), Kids 6-14 (466,000/1.3 rating), Boys 6-14 (351,000/1.9 rating), Boys 6-11 (278,000/2.3 rating) and Boys 9-14 (227,000/1.8 rating). Disney of course muddied the waters with this weeks numbers by adding a new category of viewers, “Tweens,” covering the 9-14 year old demographic. Unfortunately that creates some overlap with the standard 6-11 demographic, but by getting out my trusty calculator, and applying some math skills, I was able to find more interesting results again in these numbers, especially as it relates to young female viewers. While the press release focuses almost exclusively on boys there are some encouraging signs for fangirls. The DisneyXD series premiere, Droids In Distress, had nearly 112,000 female viewers ages 6-14, however this week’s episode saw nearly 115,000 young girls take the plunge and watch Rebels despite overall viewership being down some 86,000 from the premiere. While Droids In Distress managed to attract some 73,000 girls age 6-11, this week’s broadcast brought in nearly 8,000 more young female viewers for a total of 81,000. And despite the smaller viewer base from Droids, the 12-14 age demographic among young girls remained largely unchanged shedding only 5,000 viewers in that bracket. While girls 6-11 only made up 22% of all viewers in that demographic, young female Padawans ages 12-14 made up 30% of all viewers 12-14. Once again the 12-14 demographic is very enlightening, and it appears male viewers in that age range are moving away from the show, with some 13,000 fewer boys taking in the show. Meanwhile female viewership remains in the 12-14 demographic remains largely stable. Boys 12-14 make up only 20% of all male viewers 6-14, while girls 12-14 still make up over 30% of all female viewers 6-14. Again the show has demonstrated an attraction with young tween/teen girls, and Disney should be exploiting that. I would encourage fangirls to keep spreading the word about the show, and keep applying pressure on Disney, and the folks at Lucasfilm, to broadcast the show on a channel that more young girls are likely to watch, like the Disney Channel. DisneyXD’s most successful animated show to date, Ultimate Spider-Man, just completed a highly successful run on the Disney Channel bringing in almost 2 million viewers and episode. 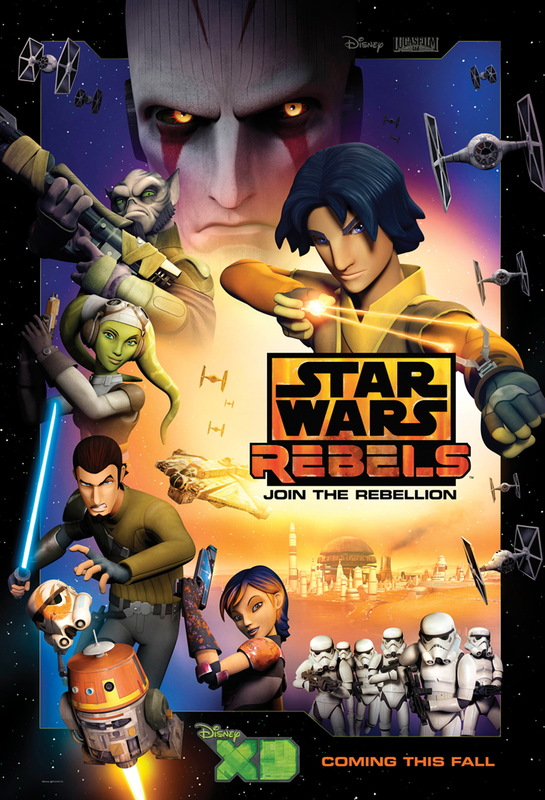 With the increased exposure of broadcasting on Disney Channel it is likely Rebels would perform as well, if not better. Additionally, I think periodic broadcasts on ABC could expand the viewer base as well. Considering how good Rise of the Old Masters was, there is every reason to believe Rebels will be able to hold onto viewers better than DisneyXD’s debut episode. So keep spreading the word, and keep watching! Fair warning: Rise of the Masters has yet to air on DisneyXD so there are SPOILERS ahead!!! I approached the newest episode of Star Wars Rebels with a bit of trepidation. 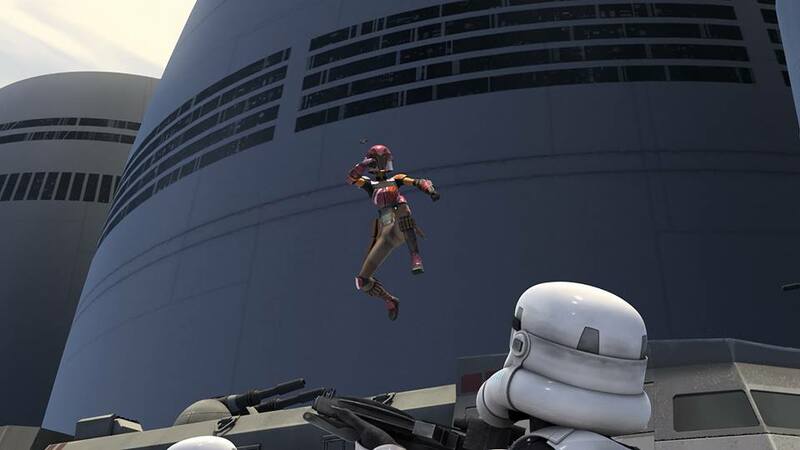 After all, as I said in my review of Rise of the Old Masters, that episode was near perfection and rivaled many of my favorite Clone Wars episodes; Breaking Ranks had a lot to prove, and boy was it ever up to the task. I don’t often throw around the word superlative to describe things. I usually reserve it for something that has had a profound effect on me, or resonated with me on some level. While I loved every episode of The Clone Wars – Lost Missions, I have not had such a visceral thrill or wave of emotion come over me watching Star Wars since watching The Wrong Jedi, the final broadcast episode of Clone Wars. To further make the point how moved I was by Breaking Ranks, when it was over I immediately Tweeted writer/producer Greg Weisman (who wrote this episode), and thanked him for this story. Breaking Ranks is a simple story, and that’s what makes it work so well, especially given its 22 minute run time. As our episode begins, Ezra has been on a mission for the crew to infiltrate the Imperial Academy and pose as a cadet so he can get access to data files which include the coordinates of a convoy that is in possession of some incredibly potent weapon for the Empire. Both Ezra and Chopper have infiltrated the facility and have been working on the inside for weeks when our story opens. And while Kanan says he is confident in his young Padawan’s ability to complete the mission, he is clearly concerned Ezra is in over his head. Ezra and his fellows cadets are lowered into an ominous Imperial testing facility known as The Well. They are required to climb a series of moving platforms as quickly as possible while the Academy Commandant measures their stamina, physical prowess, and ability to think quickly and independently. As the episode unfolds they are placed inside The Well multiple times, each time with a slight twist to the test. What the cadets are unaware of though is that the Empire also uses this examine to determine the potential Force abilities of the trainees, for a purpose that will be revealed later. One of the things I really appreciated about these sequences was how they felt familiar. 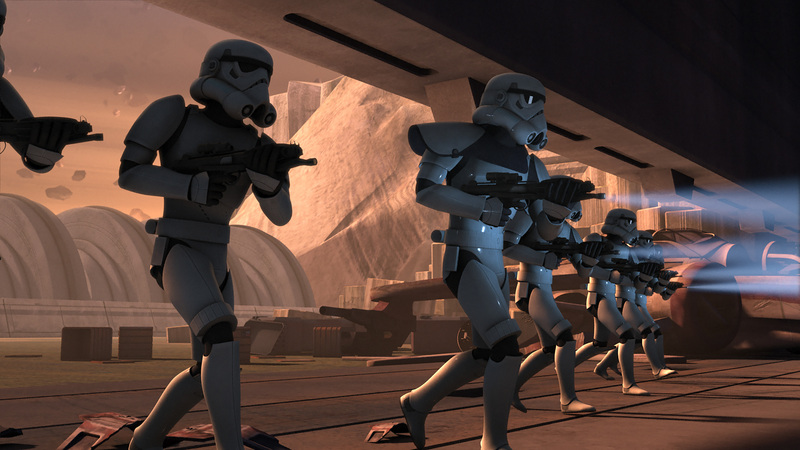 Season 3 of The Clone Wars began with a spectacular arc following a group of Clone Trooper cadets. The testing facility has a similar look to the training facilities on Kamino, and even The Well feels eerily to a bounty hunter testing facility from the Season 4 Episode, The Box. The episode does a spectacular job tying itself to the lore of Star Wars. While attempting to make communication with Chopper, who is in disguise as a black-painted (of course) old Imperial droid, Ezra unwittingly draws the attention of one of his fellow cadets, Zare Leonis. Zare follows Ezra to Agent Kallus’ office, and watches as Ezra tries to steal the encrypted disc the crew needs to intercept the Imperial shipment. 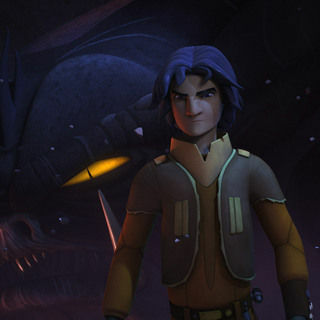 Zare confronts Ezra over his apparent betrayal, but Ezra senses there is something off about his fellow cadet. 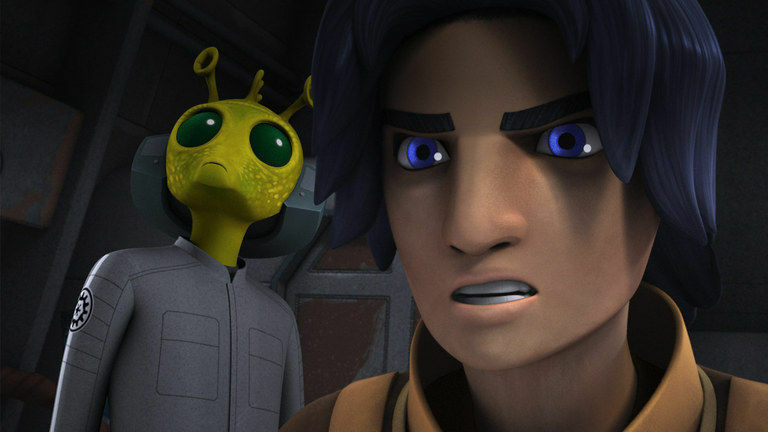 Zare warns Ezra that he is about to set off an alarm if he simply tries to walk out of Kallus’ office with the disc. Finally, Zare admits he is under cover as well, looking for his sister who trained at this facility and never returned. The two decide to join forces and find another way to steal the disc. Later Zare attempts to distract Kallus while Ezra uses the Force to life the disc out of the office into a ventilation duct where Ezra is hiding. After stealing the disc Ezra overhears an alarming conversation between the Commandant and the Inquisitor; not only are the Imperials testing for Force abilities among the cadets, but those that do will be delivered to the Inquisitor for special training. 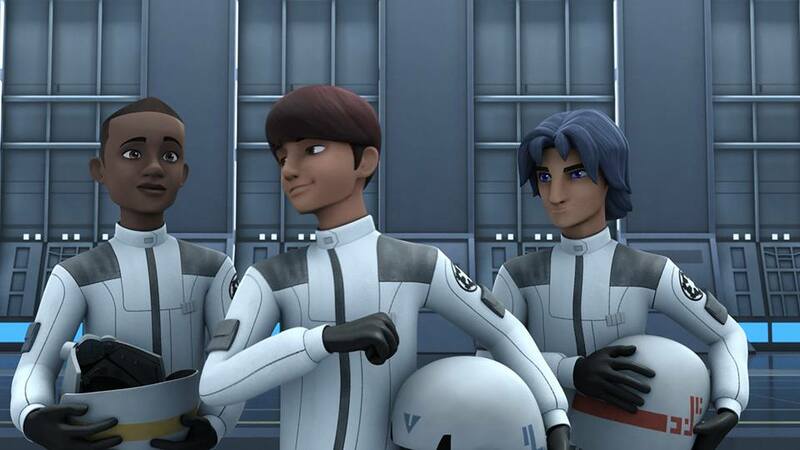 The two candidates the Commandant has eyed for this training are Ezra, and another cadet named Jai. Ezra delivers the disc to Hera and Kanan, but informs his Master that he is staying behind to help his friends, much to Kanan’s dismay. Ezra must help Jai and Zare escape, but Jai is reluctant, he appears to want to be given this chance at what he thinks might be a better life. Both Ezra and Zare implore the young cadet that he will probably never see his mother again if he stays. Jai agrees and their plan is set into action. Meanwhile Hera and Kanan arrive at the coordinates for the rendezvous and find a group of three ships. We then learn what the Ghost crew’s mission has been all along. This convoy carries special cargo, a Kyber Crystal, and enormous crystal with incredible destructive power (give you a guess what it’s for…). Hera and Kanan must locate the ship carrying the crustal and destroy it before the ship jumps into hysperspace. The Imperials catch sight of the Ghost and the battle begins. 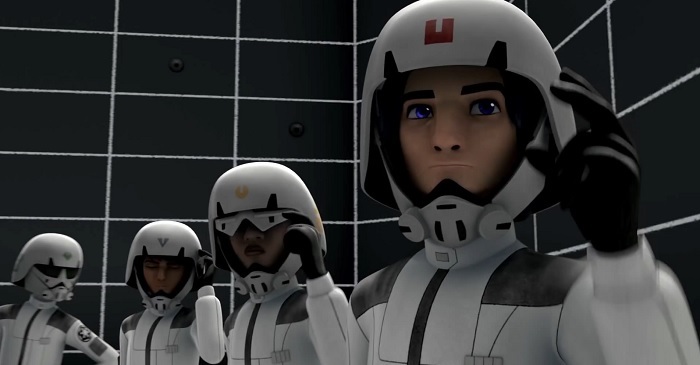 On Lothal, at the Imperial Academy, the cadets go through one last test in The Well. Ezra, Jai, and Zare must win the competition, so they will be stationed in the facility’s enormous landing bay when their escape plan is launched. Unfortunately one of the loyal students intervenes and stuns Zare before he can reach the top. Thinking quickly, Ezra sacrifices himself, allowing Zare to be one of the final three contestants; Ezra will have to devise a new plan. Finally Zeb and Sabine launch their attack on the Academy, and Zare and Jai take control of a small AT-ST walker firing at troops and vehicles, creating a diversion for their escape. Using his incredible powers Ezra jumps onto the walker as more troops approach. Hera and Kanan are finally able to locate their target and begin their attack, however, waves of TIE fighters attack the Ghost. All appears lost when the Imperials are about to jump to lightspeed, however, Hera’s fancy flying and a few well placed shots destroy the Imperial ship, and a enormous shockwave erupts from the vessel. The Imperial ships are consumed by an enormous energy ball, but out heroes narrowly escape making the jump to lightspeed. Back on Lothal, Ezra, Jai, and Zare are finally able to escape the Academy as Zeb and Sabine finish off the last of the Stormtroopers. As they are about to leave Zare tells Ezra he’s not going; he must stay behind and keep searching for his sister and the Academy is his best start. As out heroes escape Zare takes a couple of shots at their escaping speeder, to ensure the Imperials are not suspicious of his mutiny. As our story concludes, Zare is taken before the Inquisitor who asks asks the young cadet all he knows about Ezra. Zare is trapped… for now. Jai is sent off to find his mother so they can hide from the Empire who will surely try to track the young Force sensitive down. Finally, Kanan and Ezra are reunited. 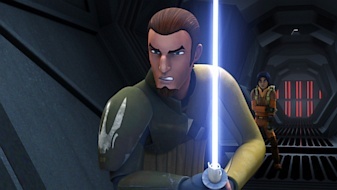 Kanan finally comes to terms with the fact that his young apprentice is capable, and he should stop doubting him. Ezra, like Daniel in the Bible, has emerged from the proverbial Lion’s Den with his faith tested and strengthened. He’s no longer the Lothal street rat without purpose; he is becoming a man. The pacing of this episode is perfect, there’s absolutely no fat in this story, but there’s more than enough meat on the bone to sink our teeth into. I never once felt cheated as a viewer, as if I were missing something, or the story needed to be padded… everything felt right. There’s a growing tension throughout the episode as we wonder if Ezra will be caught during his mission, what are Zare’s intentions, will the Inquisitor finally get his hands on Ezra, and what exactly is the Ghost’s mission? All of these questions finally culminate in a thrilling and dramatic conclusion. 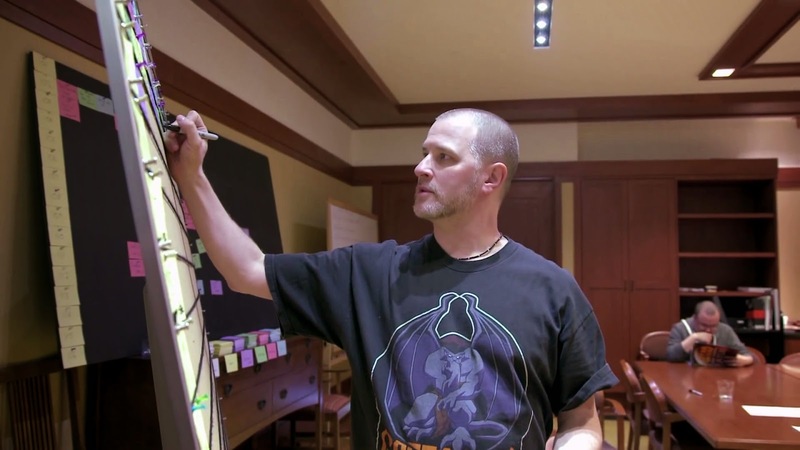 Years ago, when Dave Filoni was still the Supervising Director of The Clone Wars, he once said in an interview that he was “learning how to make Star Wars from George (Lucas);” clearly Dave was a great student, and George was a brilliant teacher. The tension filled finale with Ezra, Zare, and Jai trying to escape the Imperial Academy with their lives, cross cut with Hera and Kanan on the Ghost trying to destroy the Kyber Crystal, is nothing short of classic Star Wars. It recalls the epic final battles from A New Hope, Return of the Jedi, The Phantom Menace, and Attack of the Clones as we cut back and forth between our heroes building tension and drama. The stakes are enormous and there is a frenetic pace to the editing, that often leaves the viewer doubting, just for brief moments, whether our heroes will survive. Composer Kevin Kiner’s score keeps the tempo and ends with just the right dramatic flourishes at the perfect moments. For a few minutes I forgot I was watching a weekly animated kids show. 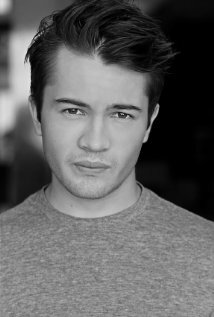 Taylor Gray is nothing short of stunning as Ezra Bridger. I was initially concerned about the character and his similarities to a certain Arabian Disney “street rat.” However, in only a handful of episodes all of those concerns have been swept away. He has brought a level of depth to the character that I never believed would materialize, and his performance as the young Jedi-to-be is filled with energy, compassion, thoughtfulness, and a sense of purpose. Since Ezra has taken on the responsibilities of a Jedi Padawan, there is a seriousness to him and a sense that he is growing in confidence. While he still has that roguish charm, and is quick with a sardonic joke, he is beginning to come into his own as a young man. One of the things that really makes Ezra stand out to me is his growth. When the series first began he was simply looking out for himself and very reluctant to get involved in the affairs of the crew. But as the story continues we can see his maturation. He is becoming a selfless warrior for the less fortunate around him. In the final test at The Well he willingly sacrifices himself so that Zare can be a finalist and get a chance to escape. He is beginning to realize that his gifts in the Force can be a benefit, not just to himself, but to those around him, and that he can use those abilities to help change other people’s circumstances. I have nothing bad to say about this episode, except that it ended. Oh, one little nitpick… If you haven’t watched the unfinished four part Crystal Crisis on Utapau arc (what are you waiting for) from The Clone Wars, you wont fully get the reference of the Kyber Crystal, But even if you haven’t, the crystal still functions as a classic film MacGuffin, that thing the heroes are always in search for, but you never truly find out what it is. Perfect pacing, perfect script, great voice acting, a solid score, terrific animation, and a thrilling conclusion make for a near perfect Star Wars adventure. Breaking Ranks is right up there with the best Clone Wars episodes, and is equally as entertaining as the films that spawned both series. I’m not sure how Dave Filoni and company topped Rise of the Old Masters, but they have. So after my epic rant about Disney’s handling of the launch of Rebels, and the dramatic drop in viewers since its debut on DisneyXD I’ve been hit with a lot of question about why the drop, is the show in danger of being cancelled, are you being just a wee bit of an alarmist? 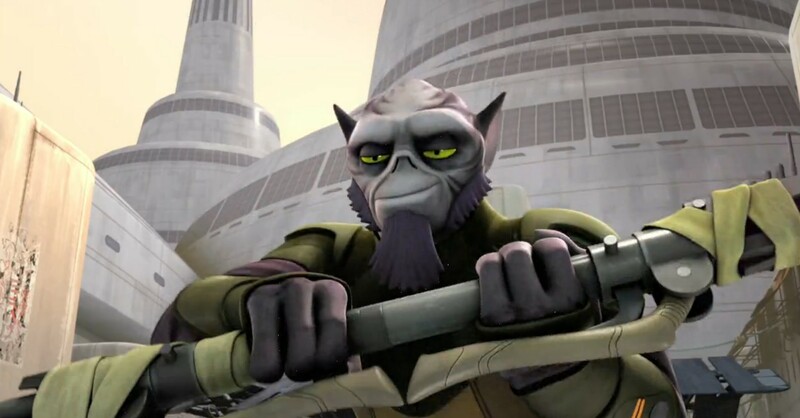 Let me state right up front; I do not believe Rebels’ cancellation is imminent, and I fully expect Disney to proceed with Season 2, but after that who knows? The whole purpose of my article was to point out to fans that there were some not so good trends going on in the numbers, and fans needed to show their support for the show to ensure the series has a long run. Also I wanted to examine why the numbers dropped, and what Disney should be doing to expand the Star Wars brand. My conclusion was that Disney needed to consider moving the show to another network like Disney channel, or at least change the broadcast date and time. After a day or so of fielding questions and talking with fellow fans I decided to dig even more into the numbers and break down demographics… that’s when I uncovered a trend that blew my mind and really demonstrated how out of touch Disney was when it came to fangirls. As of this moment we only have detailed demographic break downs of the Nielsen numbers for Spark of Rebellion and Droids In Distress. Even though the numbers for Fighter Flight have been available to Disney since Tuesday, they have chosen to remain silent, and have not even issued a press release about Monday’s numbers. So for the purposes of this examination I decided to stick with the number for Droids In Distress since the show now resides on Disney’s boy-centric network and it gives us a snapshot of what the demographics were that evening, and might reflect in the future. So, as you can see the show clearly had more viewers 6-11, but the representation of slightly older kids is nothing to sneeze at. But it was at this point where the number got REALLY interesting… in a way completely contradictory to how Disney is promoting the show. Finally, we arrive at the numbers for female viewers. According to Nielsen, a total of 112,000 girls ages 6-14 watched Droids In Distress. Overall they made up 23.3% of total viewers ages 6-14. But here’s where the numbers flip, and where Disney should be paying close attention. Yes, you read that right… Girls 12-14 made up a higher percentage of viewers in their respective demographic. They outpaced boys by almost 12% by demographic. While 39,000 viewers may not be a lot compared to 86,000, the fact that older girls were more willing to sit down and watch the show compared to their male counterparts shows there’s a lot of room for growth among early teen girls. And this isn’t really surprising as you have one female teen on the show, Sabine, and you have Hera, an older female role model. I’ll be honest, if I were at Disney, and I was looking at these numbers, I’d really begin wondering why this show isn’t on the Disney Channel. There’s more visibility, and there’s clearly more potential growth in the 12-14 year old girl than there is among boys in the same age bracket. It’s something to consider…. Just a quick follow up to my post yesterday. If you really want to show your support for Rebels and demonstrate to Disney executives that Star Wars Rebels can be a mainstream hit, then pass the word on and watch the rebroadcast of Spark of Rebellion on your local ABC station on Sunday the 26th at 7/6 PM Central Time. I’d also really encourage female fans in the Star Wars community to get the word out about the broadcast to their fellow fangirls who may not be watching the show. Disney needs to see that the Star Wars brand can reach beyond the traditional “boy” demographic. Hera and Sabine are two fantastic addition to the pantheon of Star Wars heroes and can be great role models for young female fans. But they need to be able to see the show, and Disney’s decision to relegate Rebels to DisneyXD (their “boys” network) really limits those opportunities. If the female demographics are good enough maybe Disney will consider moving the show to the Disney Channel, or at least broadcast it more frequently on the Disney Channel when girls are more likely to watch.